If you have ever seen my Acer 5930G laptop, you might remember me cursing about a grey screen that appeared occasionally while I was using it. The ritual I had discovered to fix this problem included first putting the laptop in hibernation or restarting the windows manager and then oscillating the screen back and forth until it was either restored or the pattern changed into another broken one which required yet another hibernation/restart. I had searched in vain for solutions to this problem, but yesterday (just before I leave Greece for a summer internship in Stockholm), a friend suggested a miraculous fix to this problem. It appears that the plastic cover of the area between the keyboard and screen (marked in the photo with the red rectangle) can be easily taken off using a small flat screwdriver as a wedge. 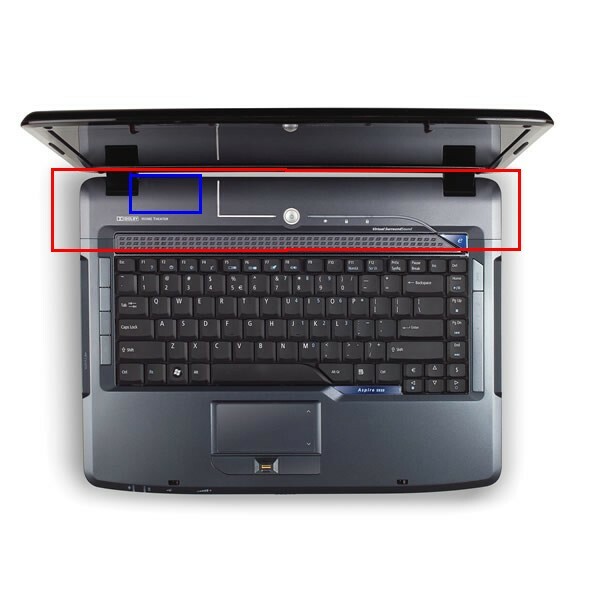 After that, the cable that connects the screen to the GPU (located in the area marked with the blue rectangle) can be unplugged, taken out, inspected and straightened. I just unplugged it from the connector, took it out of the notch it lies, straightened it a bit and then put it back. That was it! The screen looks like it won't have any further "dizzy spells". Having spent at least 9 months playing with my screen using the ritual I described, I now have my laptop back (well, battery is broken too, but that's just a matter of getting a replacement)! My eternal gratitude to stripedskies!